Welcome to the LineStar tutorial page! Don't let the terms and charts intimidate you. If you love sports and are committed to winning, you can learn how to use our top-rated products in no time! On this page you can learn the basics of LineStar and how you can use your knowledge of your favorite sports along with our advanced tools to craft amazing lineups. This section provides a series of filters and sorting options which can be used to limit and order the players shown. The following sections below will explain each of the sections in the image in greater detail. The first part of creating any lineup is knowing which slate you're building a lineup for. Select the slate you're looking for, and the players shown below will be limited to players who are a part of that slate. You can hide players from specific games or teams by clicking on a team or game element from this list. Once a team is excluded it will have a line accross it's circle to indicate it has been excluded. If the entire game has been excluded there will be a red background to indicate the entire game has been excluded. The filters provided can be especially helpful when you're attempting to find just the right match for those last lineup slots. Name: Search for a specfic player by entering part of the players name. Team: Hide all players except for those on the selected team. Position: Hide all players except for those with the selected position. Max Salary: Hide all players who have salaries higher than the entered number. To reset all filters in one action, press the Click 'Here' text. To clear a single filter, simply erase the content in the filter column, or change the selection back to the 'ALL' value at the top of the list. Somtimes it helps to see things from a different perspective, change the sorting option to see things from a different angle. Value: Players are sorted by the highest value. Value is defined by salary divided by projected points. Salary: Sorted by the players salaries. Proj: Sorted by the players projections. Loved: Sorted by the number of loves a player has received. Hated: Sorted by the number of hates a player has received. Scored: Sorted by the players points scored on the current period. Conf: Sorted by how consistent players are, generally more expensive players will have higher confidence. Chat: Sorted by players who have had the most number of chat messages for them. Advanced: Allows you to sort on even more stats, these will vary based on the sport. Pressing the settings button will reveal a list of additional options available, which are not as commonly used as other options available. Show Chart Options: Opens a popup that allows you to control chart options. You can hide charts, or toggle between the legacy and advanced chart view. 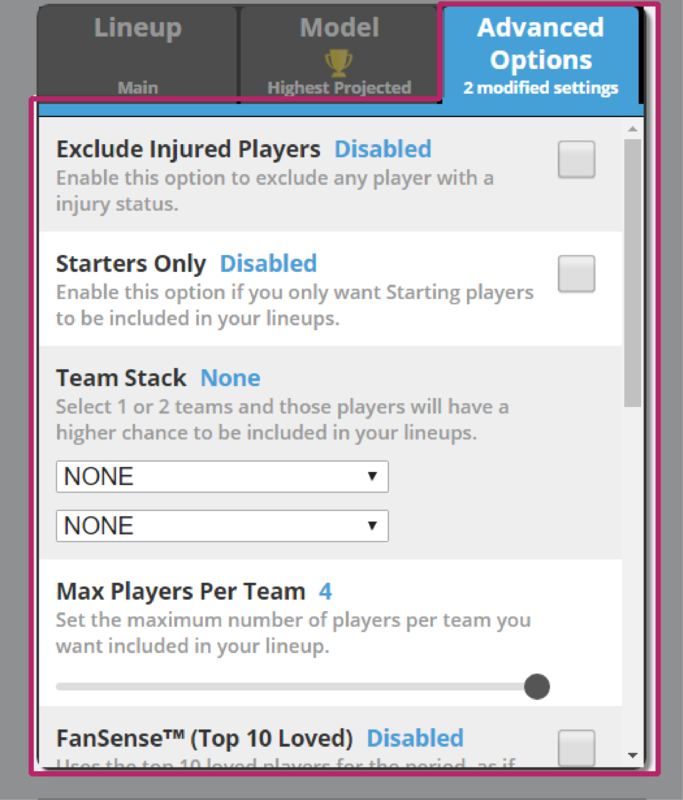 Show All Players: Players who are projected for 0 points are hidden by default. If you wish to view these players, you can toggle this option. Export Projections: Press this to export all of our projections to a .csv file. Import Projections: Press this button to import your own projections. Please follow the directions on the button. Clear My Projections: Pressing this will clear all of your projection adjustments. Clear My Love/Hate: Pressing this will clear all of your love and hate selections on players. Delete ALL Lineups: Pressing this will delete all of your lineups for this period only. There are two ways to modify player selection for Lineup Generation; loving and hating, or adjusting projections directly. To begin adjusting projections, click on the players projection which is in the green rectangle on the right side of each players box. Clicking the + sign, will increase a players projection by 1 point per click. Clicking the - sign, will decrease a players projection by 1 point per click. These adjustments are used during LineStar Lineup Generation. Hover over the heart icon next to a players name, this will give you the ability to love or hate a player. 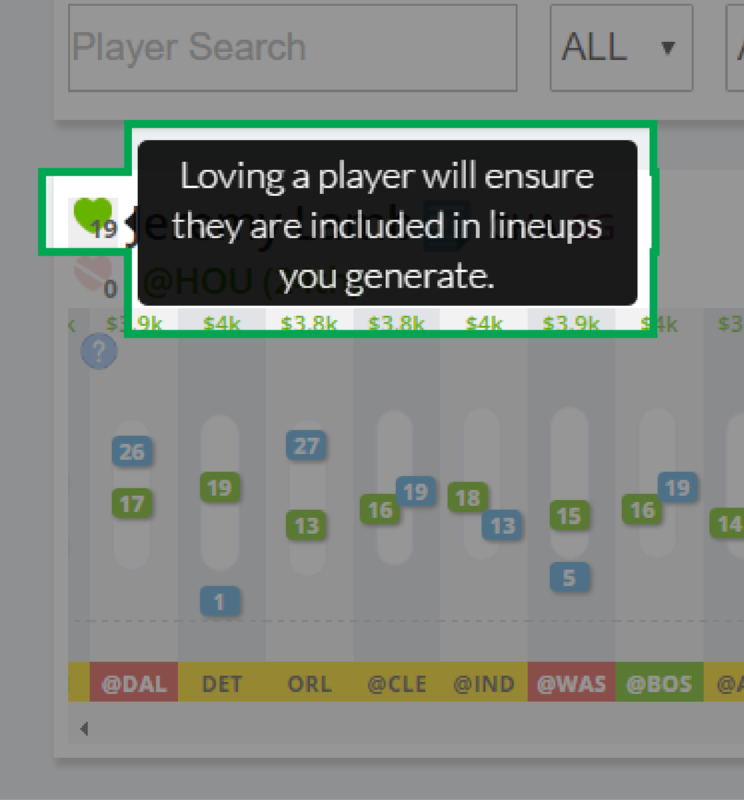 Loving a player will attempt to force that player into all Lineups generated for this period. Hating a player will prevent that player from being used for generated lineups for this period. The advanced chart contains a lot of information as clearly as possible. You can click and drag on the chart to scroll further back in the history. Current Period: The current period is always the furthest right rectangle in the chart. Salary: The Salary is visible at the top of the chart. Matchup: Shows whether the game was home/away, and the matchup opponent rating. You may also click on an opponent, which will then show all recent matchups against this opponent. Icons: The icons indicate player status, and information about the game. Numbers: The middle section of each period contains the points scored, points projected, ceiling, and floor for the player for this period. Green Circle: Fantasy points projected for this period. Box Score: Hover over a period to view the Box Score stats for that player. 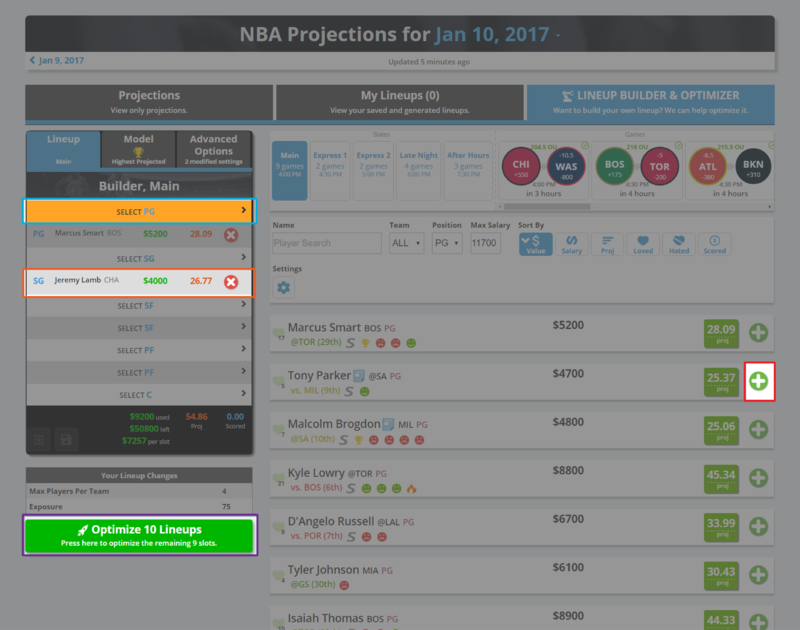 Click the 'Lineup Builder & Optimizer' tab at the top of the view to start building your lineups. Optimizing a set of lineups is extremely simple, but there are also a lot of options available if you want to diversify your lineups from other users. To optimize lineups with default options, simply press the green 'Optimize 10 Lineups' button on the left side of the screen. Change the Generate Model, there are many available. Change some advanced options. You can do things like team stack here. 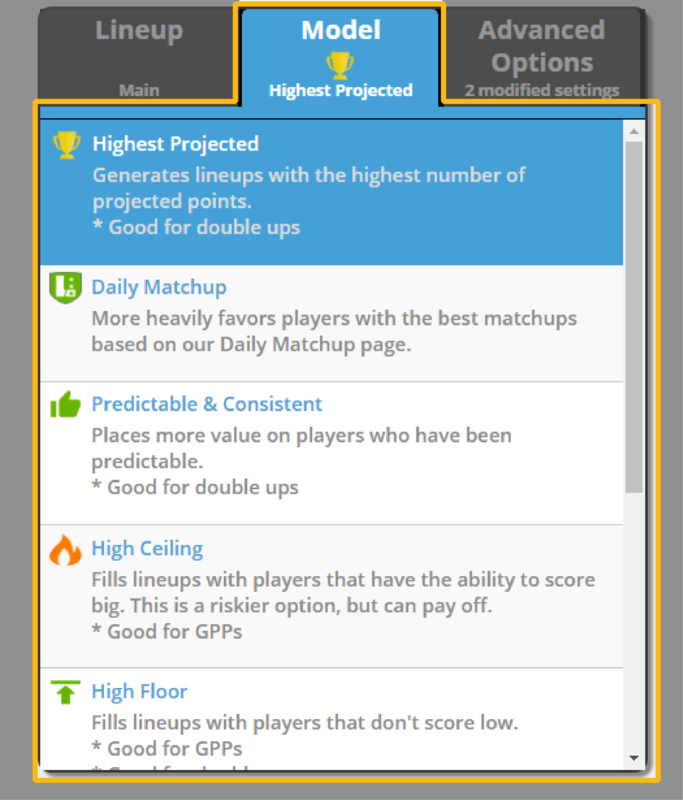 Include 1 or more players into your lineup, these players will be included in all lineups generated for this set. Click the Green PLUS button on the right side of the players box. Exclude Games or Teams, you can do so by clicking the team or game from the game list. 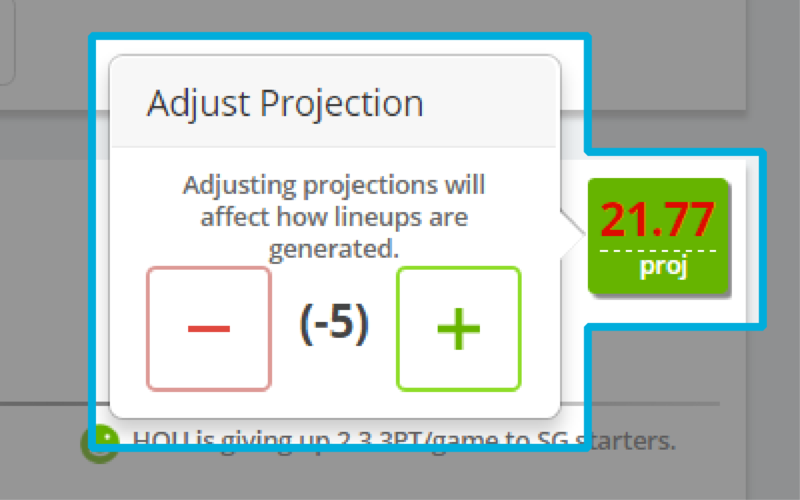 Modify player projections, these projection adjustments will affect how your lineups are generated. Love and Hate players, loved players will be included in your lineups while hated players will be excluded from all lineups. 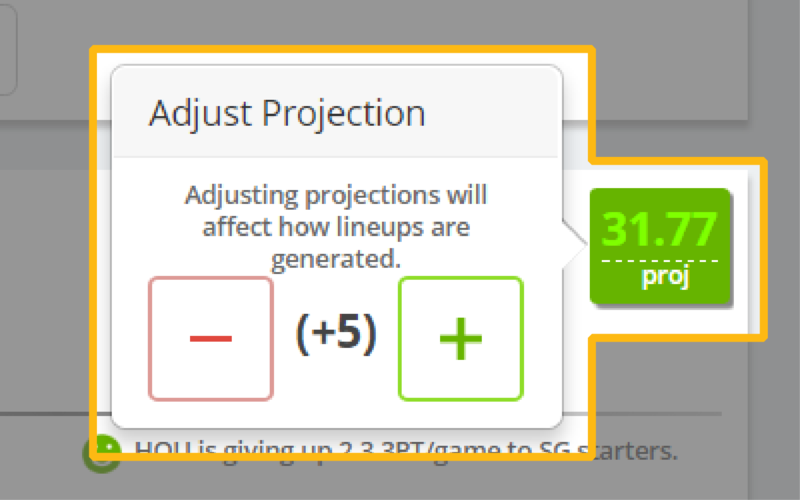 Once you are satisfied with your adjustments, press the 'Optimize Lineup' button and your lineups will begin generating, after a few seconds they will be complete and shown to you. For DraftKings and FanDuel you are able to export a lineup to a file, which you can then import directly to FanDuel Wesbite or DraftKings website. Export Lineup: Click the export button to download the .csv file, which can then be used to upload to DK or FD. You can export individual lineups, or complete sets. Delete Lineup: Click the 'X' button on a lineup, to delete that lineup, it will no longer be visible. Delete Set: Click the 'X' button on a set, the entire set of lineups will be deleted.